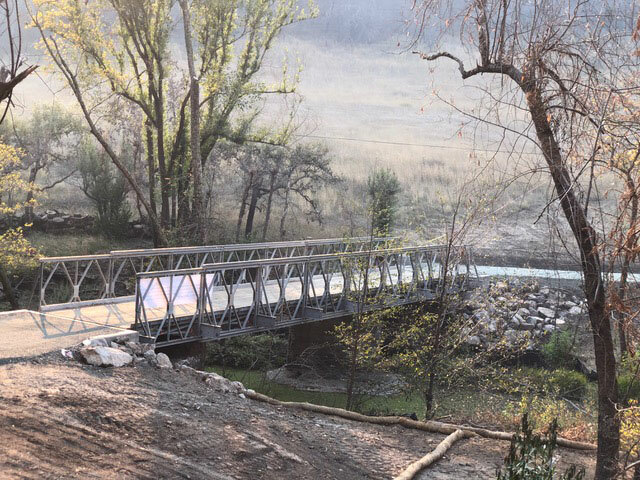 Parsippany, N.J. — An Acrow Bridge modular steel bridge was installed recently to restore passage on privately owned land in Santa Rosa, Calif., after destruction of a timber bridge during the Tubbs Fire. The second most destructive wildfire in California history, the Tubbs Fire was part of the “Northern California Firestorm,” a series of more than a dozen major fires that burned simultaneously across eight Northern California counties beginning in early October 2017. By the time the Tubbs Fire was contained, over three weeks after it began, it had destroyed more than 5,600 structures and burned an estimated 36,810 acres. At least 22 people in Sonoma County were killed. The city of Santa Rosa was particularly impacted by the disaster. Among the more than 2,800 homes destroyed, two were on the property owned by Lynn Garric, who, in addition to her homes, also lost the timber bridge that served as her link to the outside world.